Last year, Sarah Beal of Muswell Press was walking her dog in the local park when she bumped into Toby Faber, "looking very fetching in his running gear". The usual conversation about what each other was up to ensued, and Faber mentioned his first novel, a thriller called Close to the Edge. Sarah and her sister and business partner Kate read it, and liked it. 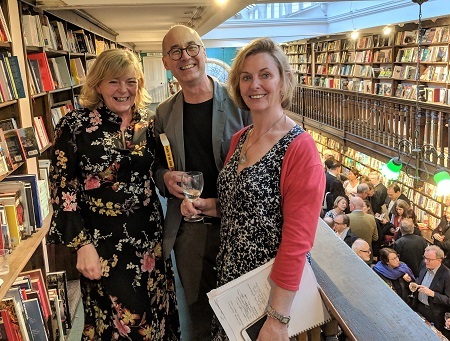 Faber's agent, Peter Straus of RCW, was happy to sell them the novel on the somewhat whimsical condition that they pay the advance in guineas, and on Thursday last week (11 April) Muswell Press launched Close to the Edge at Daunt in Marylebone. The novel comes with advance praise from authors Emily Koch and Val McDermid. It was Faber's first publication party since his non-fiction book Faberge's Eggs came out 11 years ago, and it gave him a lot of pleasure. "Here I am, on the balcony at Daunt's, with all these upturned faces - it's terrific!" he enthused - and this time his wife Amanda, who on the earlier occasion had slipped away to see the Faberge exhibition in another room, was in the audience to hear his thank-you to her. You wait over a decade for a launch party, and then two come along: in a few weeks, Faber & Faber - of which he is former MD and still a board member - marks publication of his Faber & Faber: The Untold Story, the fruit of his research among the archives of the firm his grandfather created.